Prepress Projects has its own in-house technology team of experienced people who support the IT needs of the company. In the tech team, we develop custom workflow applications and scripts to help editors and writers working on client documents. We maintain the internal network and ensure a high level of security. And we are on hand to help with any computer problems that arise, with a strong understanding of the needs of our staff and the priorities of our clients. 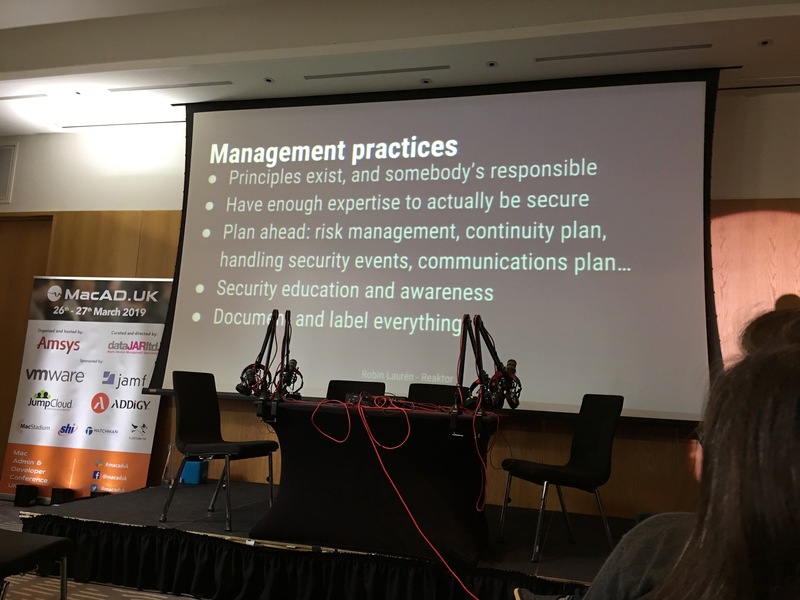 We have an ongoing training and development programme in the tech team, and as part of this I attended the Mac Admin and Developer UK conference (MacADUK 2019) on 26–27 March. This conference is held every year and concentrates on improving practice for IT professionals who work with Apple devices, both developers and administrators. We have attended in previous years and each time have come back with ideas for improvements to our IT systems. This year’s conference was in Prospero House, a dedicated conference and meeting venue just down from Borough Market. While the seating wasn’t nearly as comfy as in last year’s cinema complex, and the screens were, naturally, smaller, the food was good and there were plenty of places to sit and eat and/or talk. Moreover, there were tables! that we could eat at and work on. With a bit of judicious seat selection it was even possible to charge my laptop during sessions. The location also was very easy to get to: just 14 minutes on the Northern line from Euston to Borough and it was just across the street from the tube station. David Acland’s session on digital signatures. There was maths. Also new this year were hands-on workshops (made possible by the tables). I took part in a very enlightening session teaching us to write scripts to access web application programming interfaces (APIs), run by Ben Goodstein, a developer at the University of Oxford. Several of our custom workflow scripts link with public APIs (for example, checking references against Crossref and PubMed databases to fill in missing information). Thanks to this workshop, I now have several new techniques, a helpful new app to use in testing, and a new favourite Terminal command: “cut”. I went armed with a list of questions and had most of them answered by the end of the first day. These included queries about optimising mobile device management (MDM) systems (which allow us to automatically configure computers and install and remove software), creating configuration profiles (which can set up our computers just the way we want them, including appropriate security settings), and editing installer packages. All of these were the subject of one or more seminars or workshops, including Modern deployment workflows for business by Armin Briegel, author of several books on Mac administration; Adventures in Advanced packaging by Geoff Lee, IT services manager at the University of Edinburgh; and A modest map through the workflows of management tools by Yoann Gini, founder of Abelionni, a consulting firm specialising in information systems and security. I had other questions as well. Everyone was very helpful in either talking things through with me or finding someone more knowledgable. In some cases, I was talking to people who had written a book on the topic in question! 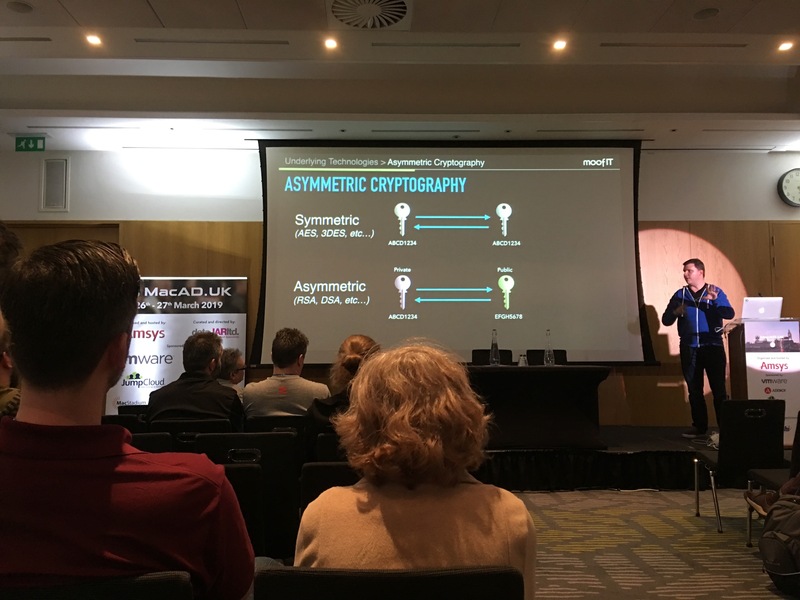 Another interesting session was Maintaining Government level security, your sanity and some of your budget, by Robin Laurén, a systems administrator at an international development firm called Reaktor. Here at Prepress Projects, some of our public sector clients trust us with highly confidential material, and this seminar was very relevant to our work. It highlighted the differences in security requirements between different countries and stressed the importance of iterative security improvements. We can never sit back and say ‘We are now secure’, because there will always be new threats and new vulnerabilities. Instead, we should have a rolling programme of security updates, test everything, and monitor access to look for unusual patterns of activity. We already do these things, but there is always more to improve. Our company uses Apple devices exclusively. (If you need us to run Windows-based software, we can do this in a virtual machine. But in almost all cases our work can be done in macOS.) We take advantage of the security features and the cross-application scripting facilities built in to macOS. It is always good to learn more about how we can create a more efficient and more secure working environment for our staff and clients.